For the first month of 2016, metal prices seemed to improve or stabilize for the most part. Gold moved $58.60 per ounce (oz) higher to $1,127.10/oz. 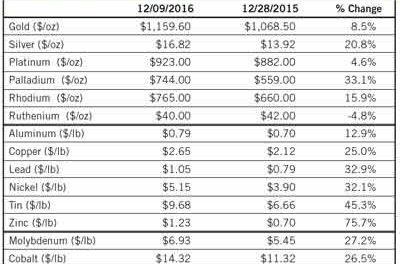 Even though platinum was only down $15/oz, palladium was down $63/oz to $496/oz, an 11.3% decrease. Iron ore improved $3.50/dry metric ton (dmt) to $44/dmt. 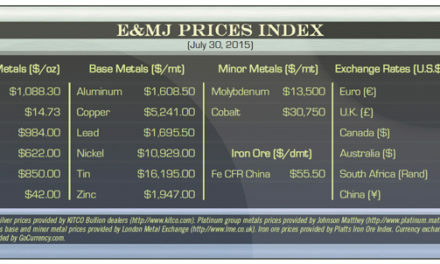 Base metals were relatively flat, except for zinc, which posted a $140.50/mt improvement of 9.2%. The International Lead and Zinc Study Group (ILZSG) released preliminary data for world lead and zinc supply and demand during mid-January. 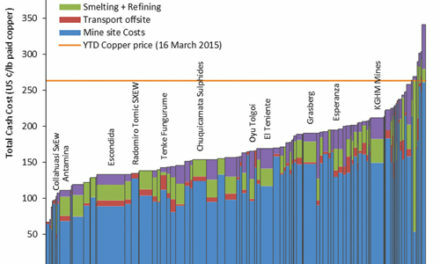 World refined lead metal supply exceeded demand by 33,000 mt during the first 11 months of 2015. Over the same period, total reported stock levels declined by 154,000 mt. 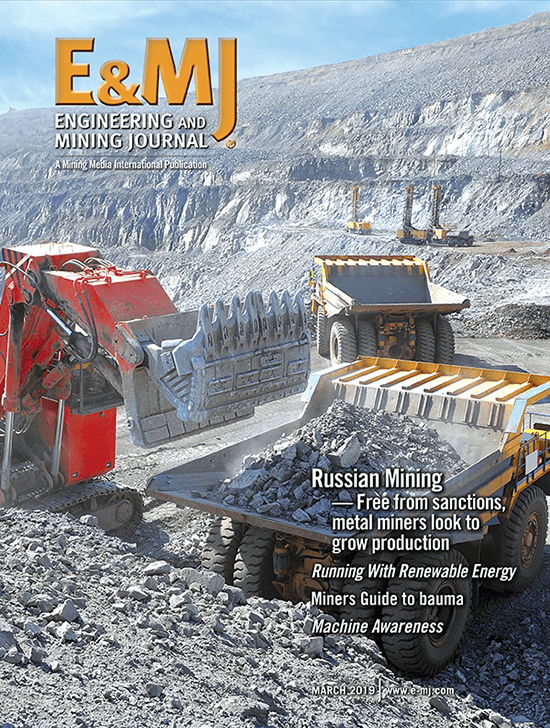 Lead mine production fell by 11.2%, primarily due to reductions of 24.1% and 7.7% in China and Australia, respectively. Significantly reduced output in China was also a major influence on the 7.6% decline in world refined lead metal production. Elsewhere, production was higher in India and the United Kingdom and lower in Japan and Peru. Demand for refined lead metal declined by 17% in China, 4.8% in the United States, and 0.7% in Europe. Overall global usage was 8% lower than during the first 11 months of 2014. China imported a record 134,000 mt of lead contained in lead concentrates in November, bringing the total for the year to 925,000 mt. The global market for refined zinc metal was in surplus by 176,000 mt for the first 11 months of 2015 with total reported inventories declining by 5,000 mt over the same period. Global zinc mine production remained about the same year-on-year with rises in Australia, India, Peru, the Russian Federation and Sweden offset by decreases in Bolivia, Canada, China, Ireland, Namibia and Turkey. An increase in world refined zinc metal production of 4.5% was mainly influenced by higher output in China and India. Increases in demand for refined zinc metal in China of 2.1% and Europe of 2.7% were partially balanced by declines in India, Japan, the Republic of Korea and the United States, resulting in an overall global rise of 1%. 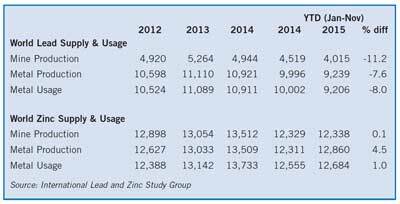 Chinese imports of zinc contained in zinc concentrates amounted to a record 1,275,000 mt over the first 11 months of 2015, a rise of 60% compared to the corresponding period of 2014. 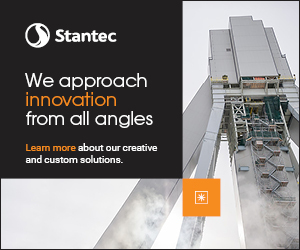 Full details are available in the January 2016 edition of the group’s 77-page Lead and Zinc Statistics Bulletin.